Slow cookers are all the rage right now, and pretty much everybody has one. Heck, you might even have one yourself. But can you monitor your slow cooker from your iPhone while you run out to the store? Can you adjust the settings from your Android phone while you’re in your backyard relaxing? We didn’t think so, but we have good news. 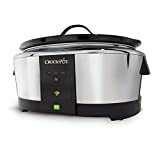 The Crock-Pot Smart Wifi-Enabled Slow Cooker is on sale on Amazon right now for half off, dropping it to its lowest price ever. Pick one up, install the free WeMo app on your iPhone or Android device, and welcome to the future of cooking.